JoJo, the King of the New York gypsies, was really pissed off. A common agricultural pest, the gypsy moth (aka lymantria dispar), was causing a record amount of damage to hardwood trees in the Northeast. In 1981 alone, it had defoliated 12.9 million acres of forest. 1982 was worse and everyone was talking about it. Jojo and his people felt this was defamatory and they wanted the moth renamed. 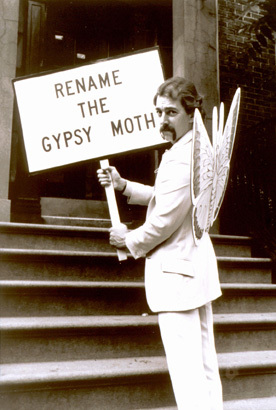 To bring attention to this plight, he formed a gypsy anti-defamation organization called Gypsies Against Stereotypical Propaganda, or G.A.S.P..
JoJo and a band of gypsies took their protest to the Governor of New York’s midtown office where they marched and chanted “Rename the Gypsy Moth! Rename the Gypsy Moth!” As they marched, they handed out flyers about their plight to passersby. 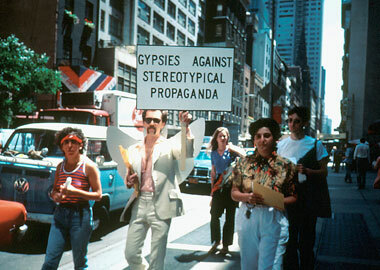 Joey Skaggs’ Gypsies Against Stereotypical Propaganda Protest. Unfortunately for Haberman, this was not the first time he had been taken in by a good story and had it publicly revealed. As a young reporter, Haberman was a stringer for The New York Times. Assigned to cover the Columbia School of Journalism graduation ceremonies, he is said to have embellished his story with fictitious graduate awards that had sexual innuendoes. He was fired for this transgression and went to work for The New York Post. This episode is covered in Gay Talese’s book The Kingdom and the Power: Behind the Scenes at The New York Times: The Institution That Influences the World . He had made his way back to The New York Times when he fell for the G.A.S.P. story. The New York Times printed a five line humorless and curt retraction of the story.